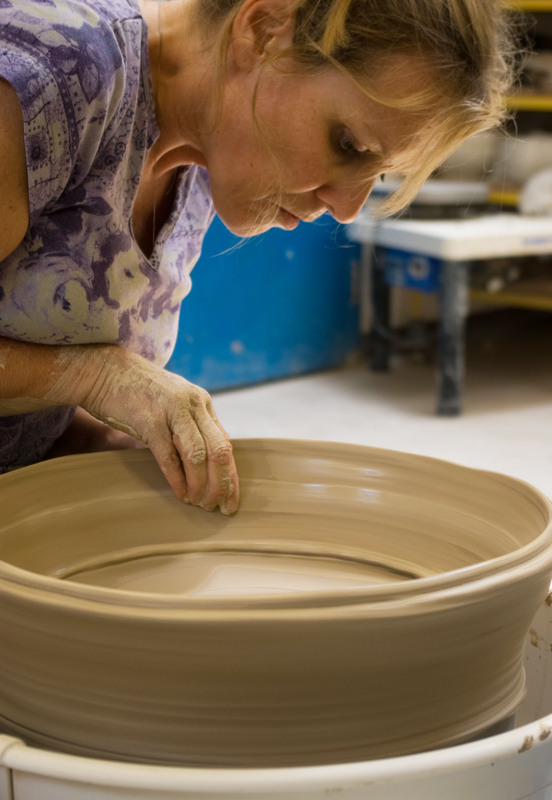 A Note to First Time Students: Welcome to the Introduction to the Potter's Wheel class at the Worcester Center for Crafts. Please wear clothes you don't mind getting a little muddy…clay will wash off, but some clays tend to stain light colored fabrics. -Bring and apron or a smock if you want. -Please do not wear open toed shoes. -If you have long hair, please wear a head band, or plan on tying it back when working on the potters wheel. -Please read and follow all studio procedures given to you during the first class. -Clay, glaze and firing cost are included in the price of 25lbs of clay and will cost $35.00 for 25 lbs. This may be paid in cash or by check, bags of clay may be shared. -Bring your pottery tools if you have some, or kits are available for ~$20.00 in the clay studio, or at retailers such as CC Lowel or Michaels. -If you have any old hand towels, bring a couple for drying your hands, as this will help us all be a little greener and not use paper towels. -Have FUN! Thanks and enjoy the class. If your class is scheduled to occur in the evenings after 5PM or if you arrive on a weekend before 10AM, please enter the facilities through our rear, handicap-accessible Studio Entrance across from the Parking Lot. The front entrance and offices lock at 5PM. As you enter through the Studio Entrance, please take a right if you are looking for the Ceramics Studio. Please take a left if you are looking for the Metals Studio or the Multimedia Studio.